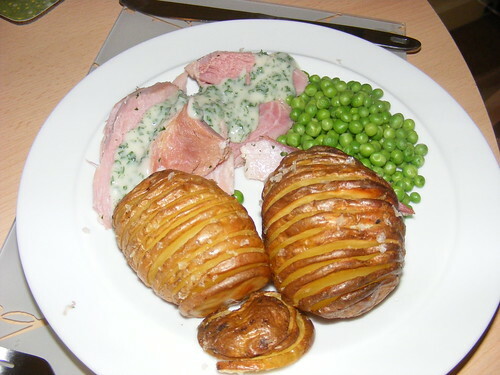 Sometimes called saddleback potatoes, this is kind of a cross between roast and baked potato. Something a little different for an ordinary midweek dinner. Plus it looks pretty. Sorry about the rubbishness of the photo. You get the idea though. Potatoes. However many you’d like. Big, small or medium. Medium-sized are the easiest to cut. Heat the oven to about 210C/410F. It’s up to you whether you peel the potatoes. I don’t, because the skin is where the goodness is, so says mums everywhere. Now cut the potato in slices, making sure you only slice about 3/4 of the way through. Handy hint: put the potato in a big spoon or ladle and the edges of the spoon will prevent the knife from slicing all the way through. Pour over some oil and rub it all over the potatoes, trying to get some in the slices. The potato won’t fan very easily but don’t worry it will once cooked. Sprinkle over some salt. Put the potatoes into the oven and cook them for about 45 minutes. Halfway through give them a bit of a shake and a little more oil, which should now slip into the slices more easily. That’s it! You could grate some cheese over it if you like, or sour cream, or whatever you like. I had mine with ham in parsley sauce. Very nice. Pickled onions! 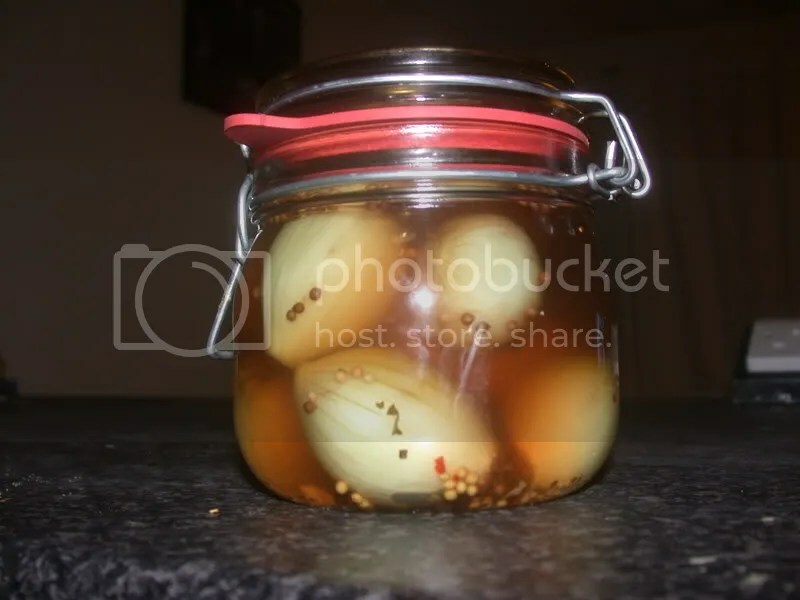 I’m making jars of pickled onions as Christmas gifts – they’re cheap to make, involve no actual cooking, and are always appreciated by those who like them (although of course you need to check that your intended recipient wouldn’t turn green at the thought of them). They need to be made now as they need time to mature, but once ready will keep for many months. You can use old jam jars for the rustic version, or do them nicely in kilner jars (as above). Giving them personal labels is a nice touch too. The process takes a couple of days but you only need to be actually doing something for about an hour of that time. Pickling spices. You can either just buy ready-selected pickling spices or you can put together a teaspoon each of mace, cinnamon, allspice berries, black peppercorns and 4 cloves and 1 chilli. First, a note: don’t use copper or iron pans for this – the acid reacts with the metal which spoils the colour and flavour. Also, you need to sterilise your jars in order to avoid the pickles going mouldy. This is quite simple – wash them in hot soapy water and then dry them in the oven on a low heat. Okay, to begin with you need to brine the onions. Heat the salt and water slowly until the salt has dissolved. Allow this to cool and meanwhile peel the onions. You can make them easier to peel by plunging the skin-on onions into boiling water for one minute (although to be honest, I didn’t bother. I just peeled them). Once cooled and peeled, prick the onions to allow the liquid to soak into them and put the onions in the cooled brine. Put some kind of weight on top of the onions to make sure they’re all submerged in the brine – I used a plate with a mug full of water on top. Now you simply set it aside for a couple of days and go about your business. After a couple of days, drain the onions and pat them dry. Pack them into your steralised jars and pour over the vinegar and sprinkle in a couple of teaspoons of the mixed pickling spices. That’s it! Ta dah! After 4 weeks or so they should be mature enough to be edible, but you may want to wait a couple of months to be sure. Eat them yourself with some strong cheddar, or stick a bow on the jar and give them to your dad as a present. Dads love pickled onions. I make no apologies for two of the main ingredients in this dish coming from tins. 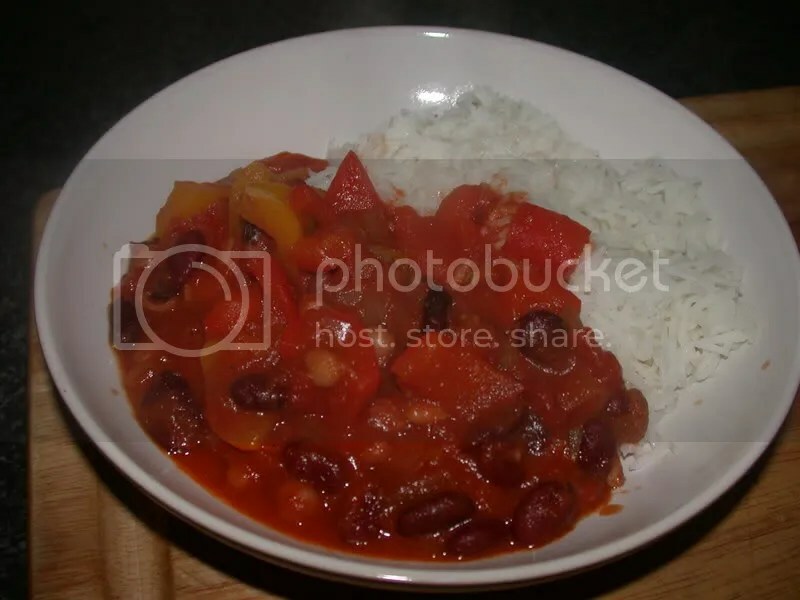 Tinned beans and tomatoes are exactly what I want for a quick midweek meal. You could make it with fresh tomatoes and beans you’ve soaked overnight and be proud of yourself that you have, but I’ll be honest and say that I rarely do. It’s a very simple weeknight dish. This is vegetarian (vegan, even) and takes about 20 minutes to prepare and cook, including the rice. Rice – however much you like. I use about two-thirds of a mug’s worth of basmati for two people. Cut the peppers in half and remove the stalks, seeds and white fibrous bits. Cut them up into reasonable sized pieces. Heat the oil and when it’s hot add the peppers and fry until they’re soft. Add the tins of tomatoes and beans and the chilli. If you want to add some other herbs or spices at this point, go ahead. You could add cumin, coriander, fenugreek, basil, thyme, basically whatever you’ve got lying around. Don’t go mad and add everything though, stick to one or two spices. While the chilli is simmering, rinse the rice and bring it to the boil in salted water for however long the packet says to. With white basmati rice, I cook 2/3rds of a mug in 1 1/2 mugs of water for around 10 minutes (timing it from when the water comes to the boil), which usually works. Serve it all together. It’s not fussy and grand, but it is a good healthy tasty supper. This dish is everything I want in a home-made curry – full of taste, easy to make, and easy on the budget. It’s vegetarian (vegan, even), low-fat, takes half an hour in a single pan and uses only storecupboard ingredients. How much more perfect could it be? My mother-in-law gave me this recipe and she knows what she’s on about. Some peas, fresh or frozen. However much you like. Chop up the onion really finely, as finely as you can bear with tears streaming down your face. If possible, it should be almost chopped to a paste although don’t worry if it’s not. Melt the butter in a non-stick saucepan on a low-to-medium heat and when it starts to foam, add the onion. Stir it occasionally as you get on with the other stuff, but not too much, it’s nice when it catches a bit. Now cut up the potatoes into roughly equal-sized chunks. If you’re using new potatoes just halve them. Mix together the coriander, cumin, cayenne, sugar, chilli, salt and pepper (but not the garam masala). 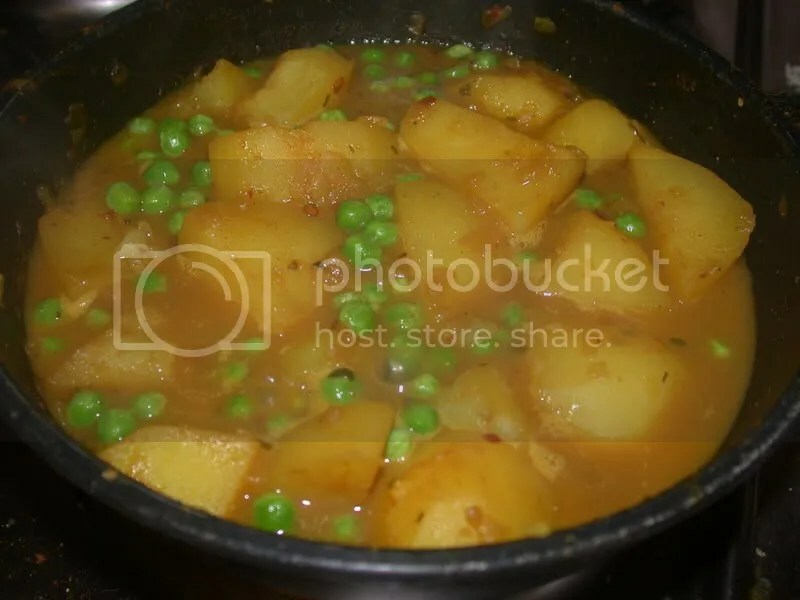 When the onions are golden brown, almost burnt, add the potatoes and the spice mix, give it a good stir so the onions and potato are coated and let it cook for a minute. Then pour in some cold water, enough to almost cover the potatoes. Bring the whole thing up to the boil and let it bubble away for 15 minutes, stirring occasionally and tasting often – if you feel it needs more salt then add it. As the potato softens and the liquid reduces a bit, smoosh a couple of the potatoes into the liquid to thicken it. If it gets a bit dry, add more water. If it’s too watery, smoosh some more of the potato into it and turn up the heat and reduce the liquid some more. Use the mighty power of your brain. After 15 minutes, check if the potatoes are almost-but-not-completely cooked. If they are, add the peas (if they’re not, cook them some more until they are, obviously). 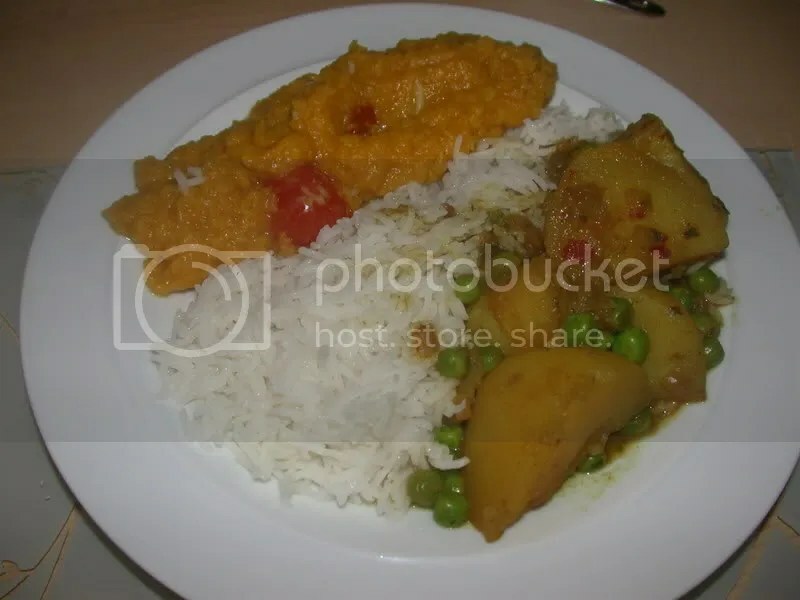 Once the peas are cooked (about 5 minutes), sprinkle over the garam masala, stir it around for another minute and serve it up with basmati rice and dhal, if you like. This lasagna is definitely vegetarian and almost vegan, and you could easily make it vegan by replacing the milk with an alternative like soy milk or rice milk. 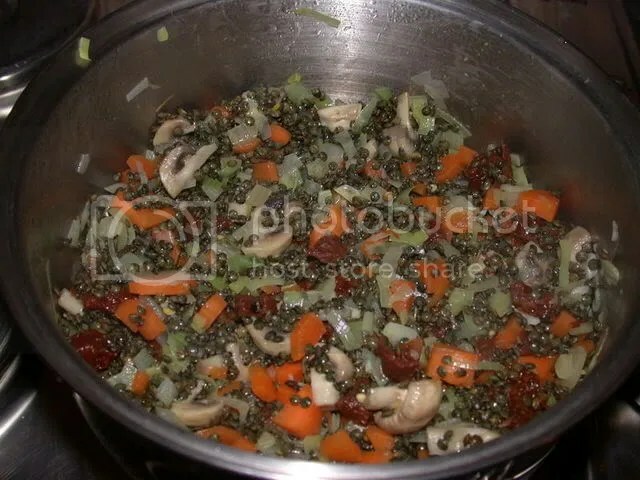 I’m a committed meat-eater but this meal is lush – puy lentils have a lovely earthy flavour and keep their texture well. The ingredients list isn’t prescriptive – if you’ve got leeks, or spring onions, or pretty much any vegetable lying around, chop them up and chuck them in. It all adds to the taste. Lasagna sheets (make sure there’s no egg in the pasta if you’re doing it vegan). I use the no-pre-cook ones, so you don’t need to cook them at all beforehand. Pour in the stock and tomatoes and the bay leaves. Bring up to the boil and simmer for around half an hour, stirring and tasting every now and again. Add salt and pepper if you think it needs it. Set it aside to mellow out a bit. If you want to, you can stop at this point and freeze it for later use. Now put the pint of milk in a pan on the hob on a medium heat. Mix the cornflour with a little bit of water and add it to the milk. Heat it all up slowly, stirring often, until it thickens. If you want to (and you’re not a vegan, obviously), you can add some grated cheese to this sauce. I don’t in order to keep it low-fat and feel virtuous. Add salt and pepper to taste. 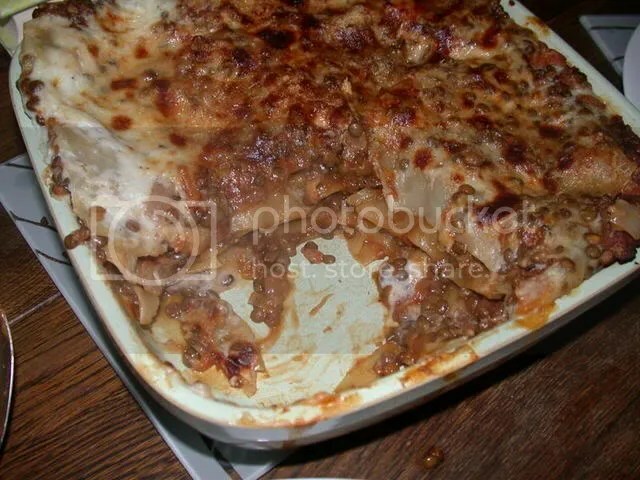 Now lay out some sheets of lasagne on the bottom of your dish. The reason I put lasagne sheets as the first layer is that it makes it easier to lift out a slice whole from the cooked dish. Little tip for you there. Ladle on about a third of the lentil and veg mixture, and spread it out to cover the base. Pour over about a third of the white sauce, and then do another layer of lasagne sheets. Repeat twice, finishing up with a layer of white sauce. Non-vegans can add some grated cheese on top. Parmesan is nice. Cook in the oven for around half an hour, until it goes nice and brown on top. Bring to the table and dig in, it’s flipping lovely.